Theresa May’s Brexit negotiators want to secure a written promise of a transition deal from the European Union at a key summit this week, to help reassure businesses that they will get the grace period they desperately want. 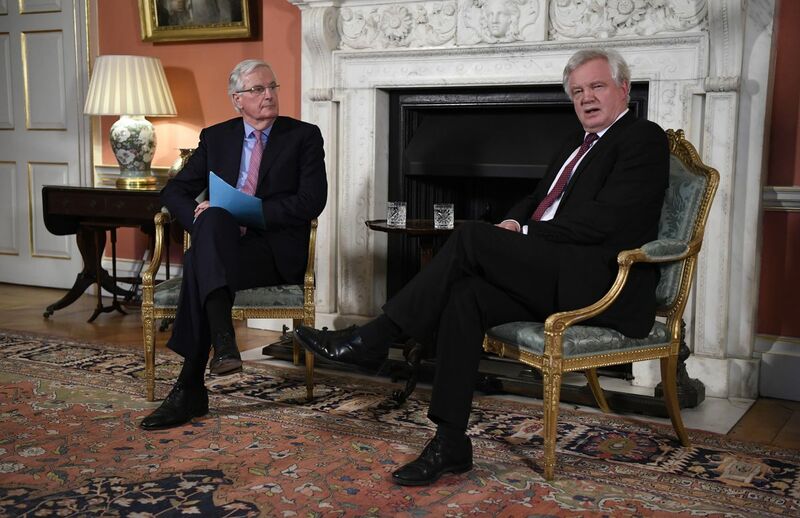 Michel Barnier, the EU’s chief Brexit negotiator, and David Davis, his British counterpart, are preparing to hold talks and a press conference in Brussels on Monday, according to people familiar with the matter. It’s a sign the two sides are on track to reach an agreement on a status-quo transition phase that will last until the end of 2020. Businesses are likely to welcome the prospect of a deal in which the U.
would continue to operate as if it were an EU member for 21 months after leaving -- accepting migrants and staying in the single market and customs union, but not having a right to vote on the rules. European leaders are due to meet for a summit in Brussels starting on Thursday, when they’re seeking to approve the transition accord and then agree on the bloc’s negotiating position for the next phase of Brexit talks -- which focuses on the future trading relationship with the U. Explicit Statement British negotiators are pushing for the EU to include an explicit statement in its negotiating guidelines at the summit. They want the document to state that an agreement in principle has been reached on the terms of transition, according to a person familiar with the matter. Businesses are pressing May’s team to give them as much reassurance as possible that they will be able to operate across Europe after Brexit without needing to change their processes to cope with new barriers such as tariffs or border checks -- at least for 21 months. Unless such a clear statement is forthcoming from the EU, financial services and other businesses are expected to accelerate their contingency plans in case there’s no deal when the U.
leaves the bloc in a year’s time. Despite the positive signals heading into the summit, concerns have grownin recent days that European officials could try to delay the transition accord until May moves further to reassure the Irish government that there’ll be no hard border with Northern Ireland after Brexit. Barnier and his team have underlined that there will be no transitional phase if the U.
and EU fail to sign a final exit agreement that includes a solution for the Irish border. Thorniest Question Whatever happens this week, the thorniest question of the Brexit negotiations is unlikely to be solved: how to police the Irish border when the U.
and the EU have announced a separate strand of negotiations during the next month seeking progress toward a solution. Irish representatives will be invited to attend the sessions. May has already rejected the EU’s draft exit treaty, which sets out a fall-back option that would ensure there’s no hard border between between the U.
and the Irish Republic, by keeping Northern Ireland in the EU’s customs union while the rest of the U. The prime minister says she will never accept such a solution because it would effectively keep Northern Ireland inside the EU’s commercial and legal jurisdiction. But EU officials say May has so far failed to offer an alternative plausible solution.